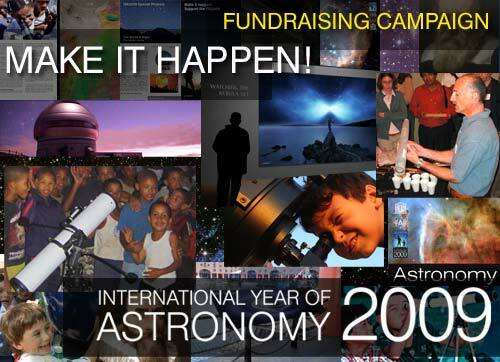 Thank you for your interest in how to support the International Year of Astronomy 2009. Your donation will help us keep our already successful projects going on and educate the general public about science and astronomy. Don't hesitate to contact us if you have further enquiries about how to help the IYA2009. To make a donation via PayPal, simply enter the amount you want to donate here and click the Donate button. Do not forget to include your name and e-mail address so we can acknowledge your donation. When you make your payment please ask the bank to include your name and email address so we can acknowledge your donation. Add the IYA2009 Donation Button on your website and help our fundraising campaign! All you have to do is to choose one of the options below, copy, and paste the provided code in the html code of your webpage.